Ingredients : Spices, Salt, Onion, Paprika, Garlic, Dextrose, Vegetable Oil (Partionally Hydrogenated Soybean Oil With BHT To Help Protect Flavor), Corn Syrup Solids, Silicon Dioxide (Anticaking Agent). 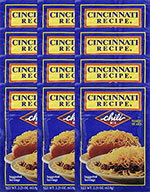 Cincinnati Recipe Mix enables cooks to make delicious chili every time. You can enjoy the chili recipe by following the directions exactly as described on the back of the Mix package. 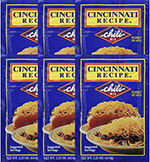 Cincinnati Recipe Mix lets you make great tasting chili every time. You can enjoy our chili recipe by following the directions exactly as described on the back of the Mix package. Or, you can experiment a little in developing your own unique chili by choosing different cuts of ground beef or by adding your own unique topping at the time of serving. 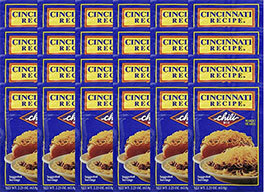 There are lots of ways to enjoy Cincinnati Recipe Mix so let’s get cookin!